Travel plans disrupted as wintry weather hits much of U.S.
CHICAGO -- The Minnesota State Patrol recorded 600 crashes statewide from Saturday to Sunday morning as wintry weather hit --- and was expected to tear across several states. There were 62 injuries, none of them serious, and no fatalities, the state patrol said, noting an additional 227 cases of vehicles spinning out/going off roads across Minnesota. The wintry weather mostly moved out of the Plains overnight and pushed into Wisconsin, Illinois and Indiana. A blanket of snow will cover the Great Lakes and the Northeast ahead of an expected dip into Arctic-cold temperatures. “A storm system developing in the Great Plains will bring wintry weather to the Midwest, Great Lakes and Northeast through the weekend into Monday,” the National Weather Service said on Sunday. A swath of heavy snow is forecast to fall from southern Wisconsin and northern Illinois eastward to upstate New York, the service said, adding that numerous Winter Storm Warnings and Winter Weather Advisories are in effect in those areas. “Traveling in this area may be hazardous,” the National Weather Service added. The Chicago area received 3 to 4 inches of snow as of Sunday morning, and could see another 3 to 5 inches Sunday. The city’s aviation website said more than 1,200 flights had been canceled at O’Hare and 175 at Midway as of late Sunday morning. In Detroit, a plane slid off the runway, according to reports on social media. 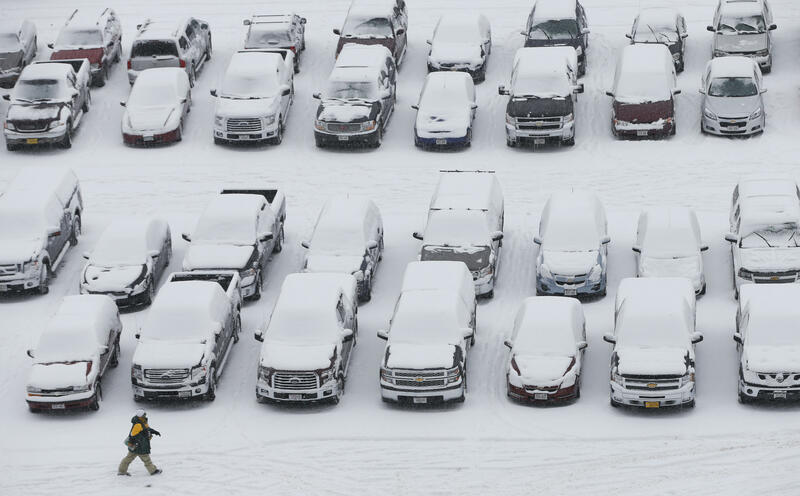 In Indiana, up to 5 inches had fallen as of Sunday morning, with more expected. Michigan could see the heaviest amount of snow Sunday, up to 10 inches. To the east, Cleveland could see up to 6 inches, while Burlington, Vermont, could get up to three.